Torquay claimed a 1-0 victory at Dagenham to lift themselves out of the League Two relegation zone. The hosts dominated for most of the first half with Zavon Hines seeing his shot superbly saved by Torquay keeper Michael Poke. But the visitors made no mistake early in the second half when Aaron Downes headed home Jak McCourt's cross. 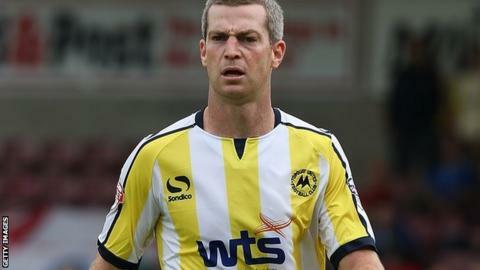 Dagenham striker Rhys Murphy struck the post late on as Torquay held on for only their fifth win of the season. "It was a repeat of last Saturday. We're asking for commitment and effort and this is the toughest place to come, and for us to come away with a 1-0 victory was well deserved I thought. "It's hard for me to say one [stand out player]. I thought the team were excellent and in the first half it was a pretty good game. "I thought they [Dagenham] passed it and looked dangerous but I thought when we got it, we did the same. "If you're in a dogfight you have to fight first, and we're doing that, so as long as we continue to do that we know that we can compete because we've got some pretty talented players as well who can play. It's so important to be out of the bottom two at Christmas." Match ends, Dagenham and Redbridge 0, Torquay United 1. Second Half ends, Dagenham and Redbridge 0, Torquay United 1. Attempt missed. Abu Ogogo (Dagenham and Redbridge) header from the left side of the six yard box is close, but misses to the left following a set piece situation. Gavin Hoyte (Dagenham and Redbridge) wins a free kick in the defensive half. Corner, Dagenham and Redbridge. Conceded by Dale Tonge. Anthony Edgar (Dagenham and Redbridge) wins a free kick in the defensive half. Corner, Dagenham and Redbridge. Conceded by Thomas Cruise. Foul by John Marquis (Torquay United). Corner, Torquay United. Conceded by Brian Saah. Attempt saved. John Marquis (Torquay United) left footed shot from outside the box is saved in the centre of the goal. Hand ball by Rhys Murphy (Dagenham and Redbridge). Substitution, Dagenham and Redbridge. Anthony Edgar replaces Medy Elito. Damien Mozika (Torquay United) wins a free kick in the attacking half. Attempt saved. Chris Dickson (Dagenham and Redbridge) right footed shot from the centre of the box is saved in the top centre of the goal. Attempt missed. Chris Dickson (Dagenham and Redbridge) left footed shot from the left side of the box is close, but misses to the right. Hand ball by Damien Mozika (Torquay United). Substitution, Torquay United. Nathan Craig replaces Jordan Chapell. John Marquis (Torquay United) wins a free kick in the defensive half. Hand ball by Thomas Cruise (Torquay United). Corner, Dagenham and Redbridge. Conceded by Anthony O'Connor. Attempt blocked. Rhys Murphy (Dagenham and Redbridge) header from the centre of the box is blocked. Corner, Dagenham and Redbridge. Conceded by Aaron Downes. Attempt blocked. Chris Dickson (Dagenham and Redbridge) right footed shot from outside the box is blocked. Attempt saved. Zavon Hines (Dagenham and Redbridge) left footed shot from the left side of the box is saved in the top centre of the goal. Attempt blocked. Medy Elito (Dagenham and Redbridge) right footed shot from the left side of the box is blocked. Attempt blocked. Abu Ogogo (Dagenham and Redbridge) right footed shot from the centre of the box is blocked. Rhys Murphy (Dagenham and Redbridge) hits the right post with a right footed shot from the right side of the box. Substitution, Dagenham and Redbridge. Chris Dickson replaces Lawson D'Ath.